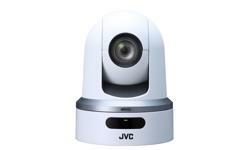 JVC’s first robotic pan, tilt and zoom video production camera, the KY-PZ100, features JVC’s unique IP communications engine, providing network connection via Wi-Fi, 4G/LTE or LAN. 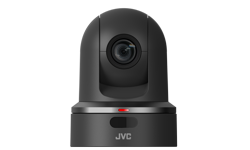 Ideal for studio or field use, the PTZ camera offers all the IP connectivity from JVC’s range of live streaming camcorders, plus a unique built-in graphics overlay capability, with full screen graphics ideal for robotic applications. Various language characters supported with provided software SDP Generator. connection via Wi-Fi*, 4G/LTE*, or wired LAN. 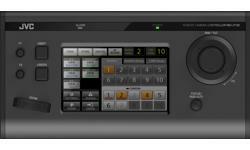 RTMP protocol support enables direct streaming to JVC VIDEOCLOUD, Ustream, YouTube, Facebook, etc. Other various protocols and bit rates are supported for a variety of usages. Multiple Protocols, RTP,ZIXI,UDP etc. also Multicast Streaming possible. of max. 480°/sec*. With maximum 480°/sec*. movement offers the scene transition sharply. of min. 0.1°/sec. Extremely slow movement of 0.1°/sec. offers a good look at the scene even at high zoom rates. normal stepping motor system, which is especially suitable for the usage of classic concert, church and so on. 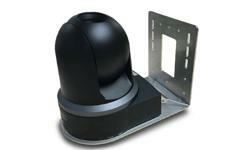 high magnification with virtually no deviation. Equipped with 30x optical zoom, the KY-PZ100 is capable of capturing distant subjects. Even in a grand hall or auditorium,the speaker’s expressions and handwriting on a board will be clearly captured. 12x digital zoom is also available. microSDHC/microSDXC card. Recordings can be uploaded from the camera to an external server. Up to 100 points of PTZ positions and other settings such as focus and white balance can be memorized on the camera. PAN Speed with AC Adapter max degree/sec. PAN Speed with POE+ max degree/sec. TILT Speed with AC Adapter max degree/sec. TILT Speed with POE+ max degree/sec. Dear Customer, for the most countries we have a recommendation of adapters, please download of info sheet for LTE support, below you find a special recommendation, which should work in the most countries.